Thanks to an item on The Guardian film blog I have been led to this extraordinary film on the British Pathe website. 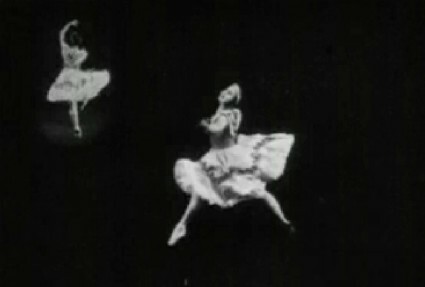 Entitled ‘Dancing Grace‘, the film shows a ballerina – unidentified on the film, but now known to be Lydia Lopokova – dancing before the camera against a black background. What makes the film so remarkable is the use of slow motion and double exposure techniques to show Lopokova effectively dancing with herself. It is an uncanny foreshadowing of Norman McLaren’s classic dance film Pas de Deux (1968), with its multiple exposures of dancers creating images of extraordinary grace and beauty, only four decades earlier. In its technique and imagination I can’t think of any film from the silent era that matches it, brief as it is. Who filmed it? The film was just one item among five in an issue of the cinemagazine Eve’s Film Review, which Pathé produced chiefly for women audiences. Much of Eve’s Film Review was shot by newsreel stalwart Ken Gordon, though nothing else in his long career points to artistry such as this. And why was it filmed? 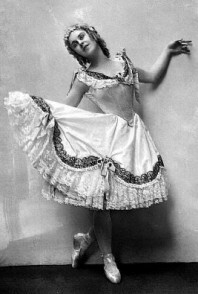 The Guardian tells the engrossing story of how Sergei Diaghilev’s Ballets Russes were in London at the end of 1921 and performing at the Alhambra in Leicester Square, where Lopokova appeared in Tchaikovsky’s ballet, ‘The Sleeping Princess’, based on the Sleeping Beauty story. The conductor of the piece, Eugene Goossens, was also conducting at the Royal Opera House, which had been hired out by American film impresario Walter Wanger for the British premiere of The Three Musketeers, starring Douglas Fairbanks. Diaghilev was intrigued by how well Goossens matched music to film, and proposed a film of ‘The Sleeping Princess’ to Wanger, ideally to be filmed in colour, the same as another film Wanger had put on at the Opera House, J. Stuart Blackton’s The Glorious Adventure, filmed in Prizmacolor and starring Lady Diana Manners. According to an article in Dance Research by Lynn Garafola, the painters Augustus John and S.H. Sime were to be involved with the sets. Given Diaghilev’s well-documented distaste for popular culture and his refusal to allow the Ballet Russes to be filmed, it would have been a remarkable change of heart – and, one would like to hope, a film of some considerable beauty. Sadly the colour film of the Ballet Russes was not to be. ‘The Sleeping Princess’ was not a success at the Alhambra and the theatre’s owner Oswald Stoll replaced it with a Norma Talmadge film, while the debt-ridden Diaghilev and his company slunk away to Paris. The Guardian piece then relates how later in 1922 Wanger hired Lopokova and Léonide Massine to dance Stravinsky’s Ragtime as part of a programme at Covent Garden which included Wesley Ruggles’ film Love, starring Louise Glaum. All of this is illuminating illustration of how film could be mixed up with the other arts, and the growing interest that film had for British high society. Half of the young upper class of London appeared in crowd scenes for The Glorious Adventure, while Lopokova and her economist husband John Maynard Keynes – first attracted to her when he saw ‘The Sleeping Princess’ – were very much a part of the Bloomsbury set (alongside Virginia Woolf, Lytton Strachey, Duncan Grant et al. ), well-born, intellectual experimenters in the arts and in ways of living, a number of whom were attracted to the cinema (Virginia Woolf wrote a notable essay ‘The Cinema’, while Keynes was a member of the Film Society, which brought Soviet film classics to Britain for the first time). There is some confusion over the date of the film. One version of it is held by the BFI National Archive, under the title Eve’s Film Review: Dancing Graces: Studies of Madame Lopokova, dating it as 1922. It is this version which currently features in an exhibition at the Victoria & Albert Museum, Diaghilev and the Golden Age of the Ballets Russes, 1909-1929. However the British Pathe version bears the Eve’s Film Review issue number 592, which the BUFVC’s News on Screen database says dates it as 6 October 1932. Presumably the film was first made in 1922 and then re-used by Pathé ten years later. There is some overlap between the two, but mostly the 1932 version is a continuation of 1922 – but no longer mentions Lopokova’s name. Meanwhile, she enjoyed a further foray into film, when she appeared alongside George Balanchine and Anton Dolin in a ballet sequence for the early British sound film, Dark Red Roses (1929). Clearly Lopokova (and Keynes) had a lasting interest in film, and the worlds of ballet and film were not seen as being completely apart. the mime in the earliest films corresponded in function if not in style to that of the more decadent classical ballets. [F]ilm and ballet have another common element – rhythm. And from the rhythmic point of view the ballet is far more like the sound film than the silent. In a silent film there are two kinds of movement: the movement of people or objects within the limits of a shot, i.e. in a given strip of film photographed without a break, and the movement expressed by the realisation of one shot to another, just as in music there is the rhythmical relation of notes to each other within the limits of a phrase and there is the rhythmical relation of phrase to phrase. Asquith therefore compares the rhythm of silent film to the rhythm of music, arguing that in each case just the one sense is affected, through the eyes or through the ears respectively. But he then argues that the rhythm of ballet is not one or the other, but ‘the relation of each to each’. All of which is a somewhat theoretical way of arguing that he wanted his ballet films to have a soundtrack. But ‘Dancing Grace’, even though it runs for no more than a minute and a half, points to a kind of ballet film that the silent film could have made its own. It gets inside the mind of the ballet, revealing its inner workings and not just its outward show. An earlier Bioscope post has traced something of the history of dance and silent film. Intriguingly it includes another Douglas Fairbanks connection, as one of the three extant silent films of Anna Pavlova is a short fragment showing her dancing ‘Columbine’ on the set of Fairbanks’ The Thief of Bagdad (1924). Diaghilev and the Golden Age of the Ballets Russes, 1909-1929 runs at the V&A until 9 January 2011 and features the Lopokova ‘Dancing Grace’ film. There is an exhibition blog post which talks about the two versions of the film. Finally, the BUFVC’s News on Screen database lists another film from 1922, now lost, from the Around the Town cinemagazine, with the description ‘Lopokova in an improptu dance “Inspired by the Sun” on ultra-rapid camera’. Around the Town was made by Gaumont, not Pathé, so did Lopokova make two slow motion ballet films (i.e. requiring an ultra-rapid camera) in 1922? Intriguing.